If you are looking for an easy way to restyle an old top, try adding ruffles to its straps and neckline. This simple DIY old clothes idea can be made with minimum sewing (easier than sewing a button) and no sewing machine. 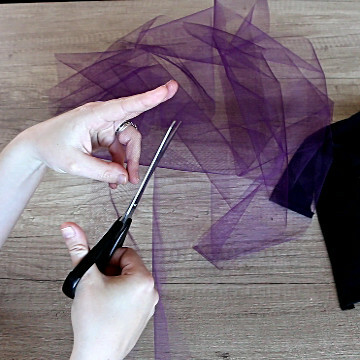 In addition to a couple of old tops, you will also need scissors, needle, tulle, and elastic thread. Below you can find materials similar to those we used for this DIY old clothes project. To start, cut two 3″ wide strips of fabric from the bottom of one of the tops. Next, cut a strip of tulle, equal to the length of the fabric strips. Cut the tulle strip through the middle, turning it into 2 thinner strips of tulle. Use an elastic thread that matches the color of the fabric strips. To determine the length of the thread, wrap it stretched around your shoulders. Place the tulle strip on top of the fabric strip and make ruffles by weaving the thread through the center of the strips. For every ruffle of fabric, make several ruffles of tulle only. Once the first fabric strip is gathered, just do the same thing with the second strip using the same thread. Then, gather the tulle and the fabric to make ruffles. Tie the ends of the thread together and distribute the ruffles along the thread. 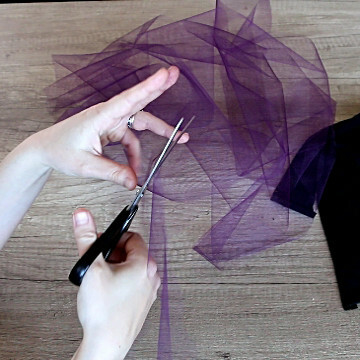 Use a regular, non-elastic thread to sew the ruffled tulle and fabric on the straps of the top. Finish up by also sewing the ruffled tulle and fabric on the front and the back of the top. Now that we have the DIY top ready, there are two ways you can wear it. The first option is having the ruffles above the straps, whereas the second one is opting for an off-shoulder look. If you want to make a matching hair accessory for this refashioned top, check out our ideas for hair ties or hair clips.